Showing results for tags 'friday the 13th'. I've noticed that people are still able to glitch on top of the Packanack Lodge. I only play the PS4 version so I don't know about Xbox One or the Steam version. Anyways, I've been seeing people glitch on top of the roof of the lodge or glitching onto the balcony of the Jarvis residence. I was in a Jason match earlier and this Mitch was standing right next to the window that's in front of the balcony. I grabbed him, he had a pocket knife and glitched through the wall. I couldn't get him with very many throwing knives cause he would try to avoid him. He basically ruined the match and just wasted time, all because he didn't want to play the game like he should've by trying to escape and helping the other counselors. It was very annoying to say the least and it's completely unfair to Jason and even other counselors who don't want to deal with time wasters. I would've left sooner in that match but I wanted to see if I could get him. I was unsuccessful but these wall glitches really need to be fixed. I hope it was unintentional for the guy but it was still annoying nonetheless. Next time it happens, I'm just leaving right off the bat because I'm not dealing with people who think it's clever to break the game to avoid getting killed rather than use actual skill. On another note, I was playing with my friend last night on Packanack and he was Jason. We were in a public match and there were probably about 2 or 3 people trying to glitch themselves on top of the roof, so I had to help kill them even though I don't ever help Jason unless people are ruining the game for others. Like I get it, glitches are cool sometimes and even fun to experiment with, but shouldn't be used in public matches like this. This game needs more patching but that may take a while. I'm fine with waiting. So the next time sometime tries glitching through the wall in Jarvis Residence, I'll just slash them to death. Not enough to read lately so... Rank the films from your favourite to least favourite- this isn't about which films you think were the best or made the best but simply what your favourites are from best to worst. Not sure if this has been addressed here and I am not gonna read through all of this forum to find it. When exactly can this damn home screening glitch be fixed? Happens to everyone I play with on the Xbox One. It is sometimes the end result of playing a long match that is already somewhat frustrating at times, then LOSING all the XP you earn in the match. So can anyone shed some light on this because this NEEDS TO BE FIXED ASAP. Offline should be updated to allow all Jason’s and items unlocked. Offline should be for fun and allow players to try out the different Jason’s and items. I don’t see the reason to connect online progress with offline bot games. Also, If someone doesn’t have an internet connection there just stuck playing part 3 Jason forever. Please look into fixing this small issue. Offline bots do mean a lot to some people and this would allow for more experimentation and practice for a lot of players. So i've noticed a few peoples saying that it might be difficult to create new and unique designs for Jason,but i on the other hand dont think so,it is still possible to think up some designs for Jason that would be new,unique and interesting,so i decided to make this topic so we could share our toughts on some concepts that linger in our minds and give opinions on them. I know that it might be a bit too soon to talk about this since the game isnt out yet,but i want to prove to some of these peoples that originality is still a possibility,heck even Tom Savini new design as some unique traits to it,even if peoples have mixed feelings about it,like the spike on the shoulder or the charcoal black color of the whole model or the fire/lava thing going on with the eyes,mouth and wounds. So here's a few concepts i would like to share with you guys......... -Savage Jason (Human) : You guys remember that scene in part 2 when the characters are around the campfire and Paul start telling the legend of Jason,then Ted show up wearing furs,a mask and a tribal spear,well what if that concept had actually been used,an alternate look for Jason wich instead of wearing farmer clothes and a sack,he would be wearing clothes made of animal furs,have long and messy hairs,scars on his body and a mask made either of wood or animal head/skin,this look would perfectly fit the whole living in the woods for years as some kind of savage person. -Winter Jason (Human) : I remember reading somewhere on internet that one of the concept for the sequel of the 2009 Remake was supposed to be set during winter,the idea of having Jason in a snowy Crystal Lake would definitely had been interesting,Jason would probably be wearing some Winter hoodie coat,winter pants,boots and gloves...so he doesnt catch a cold while killing his victims out in the cold and harsh outdoor. -Swamp Jason (Undead) : So like the name suggest,this is a undead Jason but with a more swampy look to him,a lot more green+brown colored due to all that green swamp water and swamp mud,also some water weed/plants+grass covering and growing on his body,it's basically the swamp monster version of Jason. -Toxic/Acid Jason (Human or Zombie) : What if Jason fell in a pool of toxic waste ? You would have a Jason wich appearance would look a bit more mutant like and have fluorescent green or purple colored toxic goo coming out of him. So what do you guys think ? Share your ideas too. 1: - There should be a map made based on the movie Jason takes Manhattan there should be a map where we try and escape from Jason on all levels upper and lower levels of the boat and try repairing the boat and find the missing pieces around the boat along with the tools used to repair the boat nothing to simple nor to hard to complete there should be another way to kill him on the boat and the ending should be where they escape to New York or escape from the boat on little skiffs to the city. 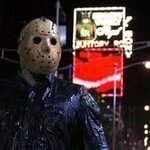 2: - all the main characters from all the Jason movies should be added like the Julius the boxer kid ,the cops from Jason lives the waitress from Jason goes to hell ,the bounty Hunter should be another alternative to call for help instead of Tommy Jarvis it would be the the bounty Hunter with the special blade that can kill Jason. 3: - new weapons should be added to the game like better escape or special stun weapons that have more damage to Jason. 4: - new and improved roll perks and Perks for Jason and counselors and all new costumes for counselors 5: - Jason should be able to choose from different weapons and have more different kill finishers . Which "Friday the 13th" are you watching this Friday the 13th? For me, I've been watching them all in order, then watching it's part of the documentary, "Crystal Lake Memories: The Complete History of Friday the 13th." (which everyone should own) I will be watching JASON X this friday. I haven't seen it in a long time, so I'm pretty excited. What if Jason never died? What if Tommy never killed Jason in part 4? What do you think he would look like? Aquatic Rumble - A new mode focused more on swimming, great for Jasons with faster water travel. With the whole thing about Part 7 needing a buff,an idea came to my mind,how about a game mode that focus more on the water aspect of some of the Jasons. Here s the idea,let say the game mode is called - Aquatic Rumble - ,basically you have a map consisting of mostly water with a bunch of small islands with one in the middle and the others scathered around. There will be like 2 or 3 boats that need to be repaired,but the parts are scattered all over the small islands,so you will need to swim from one island to the other if you want to bring those back to the boats. Of course,any Jasons with faster water travel will go very well with this mode. This would be a tense but also fun game mode to play,what do you guys think ? All the kills in the game are so far great, aswell as brutal. However, I feel like there should be more. I have tons upon tons of ideas for kills, but can only list so many at once. Here's a list of some that I have thought up that If feel would be a good contribution for the game as possible dlc weapon kills. (With fun names I also came up with) Pt 3) 1. (Timber) Jason has a wood chopping axe right? So it would seem reasonable that he will chop the counselor down like a tree. Three fatal blows to the conselor's side with the axe, only to have it getting stuck in the abdomen. Jason pulls the axe backwards only to have the conselor slowly fall forward or backward like a chopped tree 2. (When Push Comes To Shove) Jason pushes the conselor back and slams the axe onto the ground [axe head up] and gut punches the conselor having them fall forward. The conselor uses their arms to prevent falling neck first into the axe, but Jason uses his boot to shove the conselor, neck first, into the axe head-decapitating them. Pt 2) 1. (Head Pull) Jason swings the pick upwards into the conselor's neck [ similar to part 8's chin strike- except it goes to the neck]. The conselor falls to their knees, and jason walks up behind them, grabs the pick [whom's handle is upward] , and slowly tries to pull the axe back with one hand, whilist the other is holding the conselor down, overall decapitation once jason gets the pick out by pulling it. Pt 6) 1. (Throw over) Jason quickly impales the conselor in the chest and lifts them up above his head. Jason gives a quick jolt up and down with the spear, causing the conselor to slide down. After a second or two, Jason moves the spear back to throw the conselor over his shoulder, just as he glances over to make sure the deed is done. 2. (Neck Snap) Jason smacks the conselor across their face using the blunt end of the spear, causing them to stumble back and spins them backwards. Jason goes behind them and puts the spear horizontal in front of their neck and pulls back towards himself. Pinned against Jason, the conselor struggles as they are choked by the long rod. After a while, Jason quickly moves the spear clockwise, snapping the conselor's neck to the side. It would be cool if some of these ideas would be implemented into the game. I will post more kills later on. . .
Just saw this pop up in my recomended youtube videos,lol that is kinda funny. Made by AlphaGamer,its an intro wich he made for his streams. Hi my name is PapaEarl and i am here to tell you my favorite Friday the 13th movie, and its dodododododo Friday the 13th Part 4. My reasons for my choice for this are two things, first the really gory amazing death of Jason and second is kid Jarvis who is my 16th favorite horror movie actor. That's it and I am getting ready to play the new Jason when I get home. For Pc gamers they get to have their camera's zoomed out when playing Jason. Why don't you add Camera view in the setting, so players can get to play at whatever view they want to. Feel free to post any of your Friday the 13th fanart for the game or for the FT13th community in general! Can't wait to see some amazing art!